The first thing to clear up about this romantic anime released by Funimation is that it’s not a fairy-tale, and isn’t really a version of Snow White. The only brief nods to that story are in the opening episode, where there’s a poisoned apple – but the heroine doesn’t eat it – and someone says “Mirror, Mirror” – but it’s a foppish prince, not a scary queen. No, Snow White with the Red Hair is better thought of a slice of life romance, albeit set in an imagined medieval Europe. At least in the first volume, there are no dwarves, monsters or magic happenings; indeed, its heroine is effectively a scientist. Our protagonist is called Shirayuki (“Snow White” in Japanese). No princess, she’s a herbalist, a student of herbs and plants to heal the sick and wounded. In the opening scenes, she’s running her own shop, dispensing cures to customers, which would make it fair to call her an apothecary. However, Shirayuki gets uprooted from this industrious life, and it’s all the fault of her dratted hair. In this world, women with red hair are a prized commodity, and Shirayuki has drawn the interest of the fop prince mentioned earlier. He wants her, not as his queen but as his concubine, though it’s clear Shirayuki would have as little interest in one as the other. So she promptly leaves her shop and sets off on the road. Soon enough, she’ll meet another prince, as unimpressed with royal protocol as she is, but we’ll leave that to you to discover. Don’t expect an adventure story in the manner of Yona of the Dawn (another anime of a girls’ manga with a red-haired heroine). Certainly Shirayuki will face challenges. As early as part two she’s kidnapped and imprisoned in a castle, though fear not, she doesn’t wait for a strapping man to save her. But this isn’t a melodrama but a depiction of a woman making her way in the world, finding new surroundings, friends and emotions as she does. Perhaps the most familiar name in the credits is Shirayuki’s Japanese voice-actress. It’s none other than Saori Hayami, who’s now receiving acclaim for her central performance as deaf girl Shoko in A Silent Voice. Hayami also sings Snow White’s opening song. 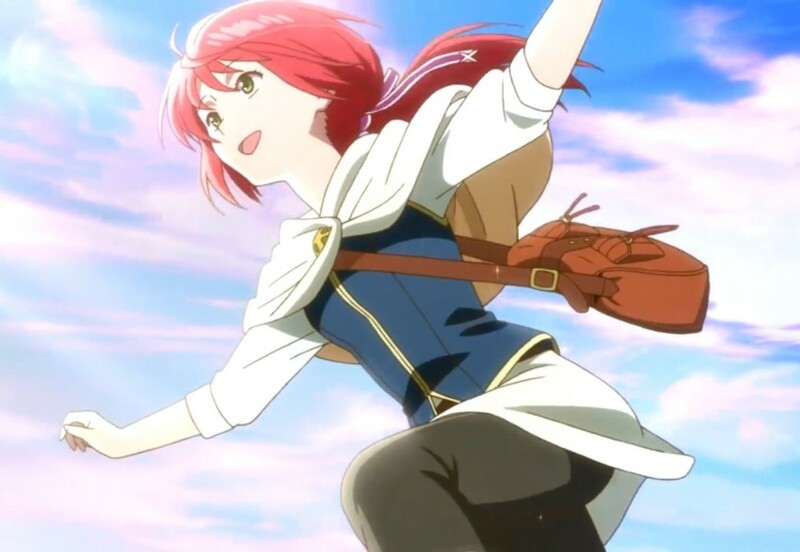 In the English dub, Shirayuki is voiced by Brina Palencia, who was Ciel in Black Butler and Rei in recent Evangelion films; but perhaps closest to Snow White, she was Holo in another leisurely fantasy, Spice and Wolf. Like A Silent Voice, Snow White has several high-level female credits beyond the actors. The original manga was written by a woman, Sorata Akizuki. Meanwhile, about half the anime’s scripts and the series composition are credited to Hitomi Mieno, who’s also known as Deko Akao. Her credits include such strange fare as Mysterious Girlfriend X, Arakawa Under the Bridge and First Love Monster. Moreover, the anime’s character designs are credited to Kumiko Takahashi, who had that role on a key girls’ anime series (and export), Cardcaptor Sakura. But the biggest surprise is Snow White’s male director. It’s Masahiro Ando, a seasoned industry pro, though he’s best-known to anime fans as the director of the samurai swashbuckler Sword of the Stranger, due for a new home release by Anime Limited this year. But then Ando works on a great range of anime, often in animation and storyboarding. For example, he often animated the horrible toddler character Crayon Shin-Chan, and storyboarded much of the marine romance A Lull in the Sea. It’s unlikely he found moving to medieval romance much of a switch. Snow White is animated by our old friend Studio Bones, with the lushness one would expect from an outfit that’s delivered top-shelf renderings of everything from post-Eva mecha (RahXephon, Eureka 7) to postmodern superheroes (My Hero Academia, Concrete Revolutio). In particular, Snow White’s opening scenes have a cinematic lushness to them as we see Shirayuki in her element, searching through a forest for botanical treasures. Best moment: she seems about to pluck white roses like a picture-book princess, then goes for an uglier but handier plant instead. Snow White with the Red Hair is released in the UK by Funimation.